You might think by the title that this post is going to touch on medieval torture and the particulars of that violent protocol. Not so much. In this case though, the concept of drawn, and then quartered, is instead a little spin on well-known time and worry management strategy. Or actually two strategies, technically. For me, one idea begets the others. Here’s the basic thinking. I’ve got a lot of different commitments and pulls on my time, currently. It’s gone on for a long while, actually. I’ve feel a bit of the tug in a rather tortuous manner during my worst moments. The quadrant concept is an important distinction, for my thinking, at least. I divide my life into four basic sections, based on what matters most to me: my wife, my kids, my work, and then everything else. The everything else rotates through the fourth quadrant: care for my elderly parents, the service club I belong to, friends, writing. So my basic goal is to spend time in each quadrant each day, to keep each area healthy, attended to, moving forward. Of course, my success ratio varies day-to-day. But that’s what I strive for. After all, it’s in the planning, and then execution, that we accomplish the things we want to in the midst of life happening every day. Remember, whether we plan or not, life happens. It’s what we make of the time that makes all the difference. “Get UP!” That’s been my mantra the last several years. I’d been a runner off and on since I was a kid, up until five years ago. Ran mostly for conditioning when I was young, then for health and weight management in adulthood. I even ran a handful of half marathons and some trail runs too. Was running pretty quick for me, feeling healthy, all good. Then after our first kid was born, time constraints and age-related aches and pains forced me to change gears. Not much running. Two more kids tightened things up even more. I had to shift gears. Running went by the wayside. I had to figure out how to integrate activity more throughout the day. Exercise went from an hour run to sprinkling more activity continuously into my daily routine. 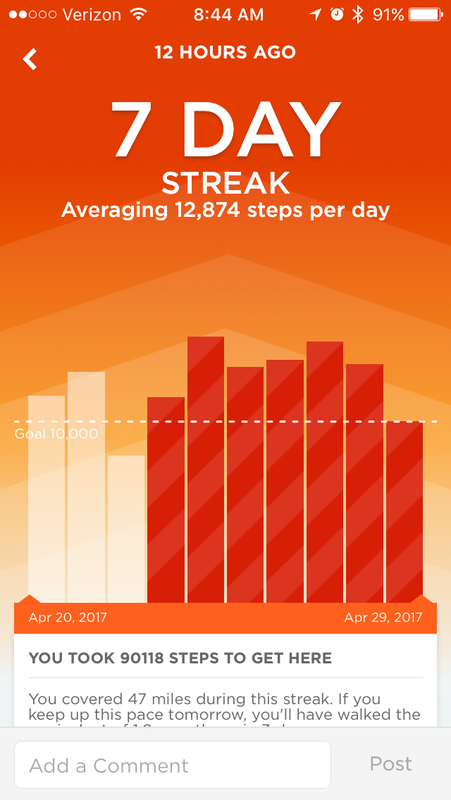 I got a step (and sleep )tracker a couple years back. The UP Move by Jawbone was my choice. One of the cheaper models, but still did what I wanted it to do. I could now tell how much activity I was actually getting each day. I make an effort now towards hitting a given Step Target most every day. Even if it’s not completely accurate, there’s no doubt I increase my activity level to get to a higher number. I’m able to dial in my efforts to get better, consistent sleep too. More energy, more steps. Steps translate to a higher level of mobility. Better mobility means more activity, which gives me a path to find and maintain a better attitude, better health, better me. And that’s all good for me. Try it. Get up and get moving. Might be good for you too.